A far-right party has won seats in a Spanish regional election for the first time in decades. The Vox party took 12 parliamentary seats in Andalusia on Sunday, beating expectations that it would win five. Tough on immigration, Vox could be a kingmaker in a coalition in Andalusia. Its breakthrough is the latest in a nationalist surge that has swept across Europe. Many had thought Spain was immune because of memories of life under a fascist dictatorship. France's far-right leader Marine Le Pen tweeted (in French): "Strong and warm congratulations to my friends from Vox, who tonight in Spain scored a meaningful result for such a young and dynamic movement." The Socialist Party has ruled Andalusia for 36 years. It still won more than any other party - 33 seats - but not enough for a majority even with potential left-wing allies. The conservative Popular Party (PP) came second, though it also lost ground. Its national leader Pablo Casado said he hoped to put together a coalition in the region with Vox and the centre-right Ciudadanos (Citizens) party, which also made big gains in the election. Between them, the three parties hold a majority of seats. The southern region of Andalusia - Spain's most populous - has high unemployment and is the main arrival point in Spain for migrants crossing the Mediterranean. The regional result is a major setback for Spain's new Prime Minister Pedro Sanchez. This is his first poll test since he came to power after the ruling PP were ousted by MPs in June over a corruption scandal. Correspondents say there has been speculation for months that Mr Sanchez could call a snap early national election to coincide with regional and European polls next May, but the Andalusia result would seem to give him little incentive to do so now. In some respects Vox resembles other parties on Europe's far-right. Its success has been at least partly due to its call for tougher immigration controls. That strategy has worked particularly well in Andalusia, the region that has received the vast majority of the nearly 53,000 migrants who have crossed the Mediterranean to Spain so far this year. But there is another, uniquely Spanish, factor behind the party's recent rise - the recent attempt by Catalonia to become independent. Although all mainstream parties take a unionist stance, Vox has gone further. 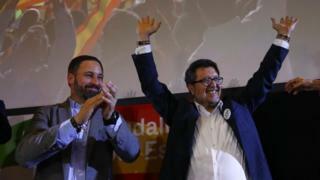 It has called for much tougher action against the independence movement and has even taken legal action against Catalan leaders - and the Andalusia result shows it has benefited at the ballot box, at the expense of other forces, particularly the Popular Party (PP). Although a voter backlash after 36 years of Socialist government in Andalusia undoubtedly helped Vox in this election, it will approach May's regional and EU ballots believing it can make a similar impact. Founded in 2014, the party has struggled to make an impact on Spain's political landscape.